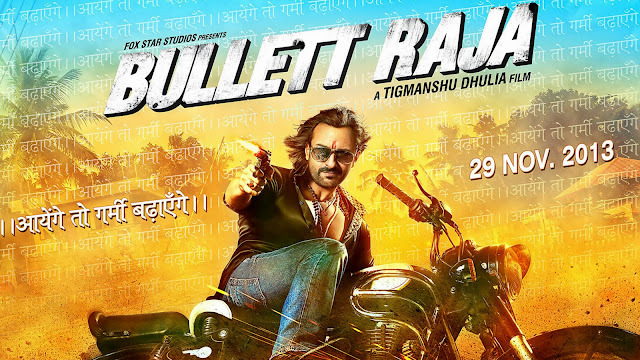 Saif Ali Khan is all set to have a blast at Indian Box office tomorrow with Bullett Raja. Sonakshi Sinha is playing female lead in the film and talented Jimmy Shergill is also in the film. We have Tigmanshu Dhulia as the sailor of this ship who has earlier directed some cult classics like Haasil, Saheb Biwi Aur Gangster and Paan Singh Tomar. The trailer of the film has clicked well with the audience and the film has created a lot of buzz. Title track of the film and Tamanche Pe Disco are popular among masses. Read our music review here. The target audience of the film is masses. But if the content is really good, it can have a good run at multiplexes also. If Bullett Raja performs well at Multiplexes then chances are good that it may emerges as one of the biggest hits of 2013. But Bullet Raja can find it tough at box office as its a UP gang crime film and this restricts the business like the Mumbai gang crime films. Here the risk is even more as with the Mumbai ones you have chances in whole of Maharashtra which has a 20% all India contribution, here it is UP which is nothing if Delhi and Punjab don't come on board with it. One more thing which goes against Bullett Raja, is that it has only one open week before the release of R.. Rajkumar. Even though its a solo release this week but we can’t completely ignore last week releases which may take some audience specially Singh Saab The Great in massy centres.